A star is born, and it could be you! This post is about the evolution of an idea, in particular in settling on what I think might be an appropriate metaphor for exploring a holistic approach to exploring and developing future-focused ways of working and organising. It has never been more possible to decide to influence how you experience work, and to take responsibility for developing future-focused skills and capabilities for yourself. Do something, learn from it. Do it together with others. Once upon a time, a long time ago, I was researching process innovation approaches to organising work. These came in different varieties, like quality, lean, just-in-time, and agile manufacturing, and they evolved over time. What I particulary loved was the fact that people on the shopfloor were now taken seriously. Their deep knowledge of customers, their work, machines, and each other, was essential to this new philosophy of work. I talked about process innovation philosophies to anyone who might be interested. I talked to people about them at conferences. I wrote blog posts. I even wrote a book saying that continuous improvement had now become connected, collective intelligence. How amazing is that? Not the book, the possibilities created by connected knowledge. Nobody listened. Well, not many anyway. I became discouraged and stopped talking about process innovation philosophies. I thought perhaps I was stuck in the past. Not that I gave up on what I know about them. I incorporated their principles into a suite of tools for developing future-focused capabilities – for both people and organisations. What a good question. What does than mean? Is current lean management thinking outdated? If so, why? Is ‘leading edge’ thinking about adopting a future-focus? How might process innovation approaches be interpreted and applied to digitally-connected organisations in the coming ‘fourth industrial revolution’, where the “scale, scope, and complexity, of the transformation will be unlike anything humankind has experienced before”? I checked out several books that Mr Lovell mentioned, and had a look John Shook’s useful Lean Transformation Framework, which he also mentioned. It uses a house as a metaphor “to think about enterprise change”. I realised that a metaphor could be useful in helping me to describe the suite of tools and learning programmes that I have been developing. It could help people to think holistically about future-focused change, and why the tools might be useful. I thought about what that metaphor might be. Could I use Shook’s framework? No point in going to unnecessary effort of creating my own if I could. The house metaphor no longer feels appropriate, though. It isn’t that I disagree with the components of the framework. Far from it. A house is too solid, too rigid for what’s happening now. That’s all about connections, networks, and relationships. Organisational walls are falling, boundaries are being breached. What other metaphor might do the trick? Inspiration escaped me. Then I remembered a friend saying she believes it is possible to explain anything with circles and triangles. There’s a challenge. So I had another think, and then it hit me. A guiding star, that’s it! 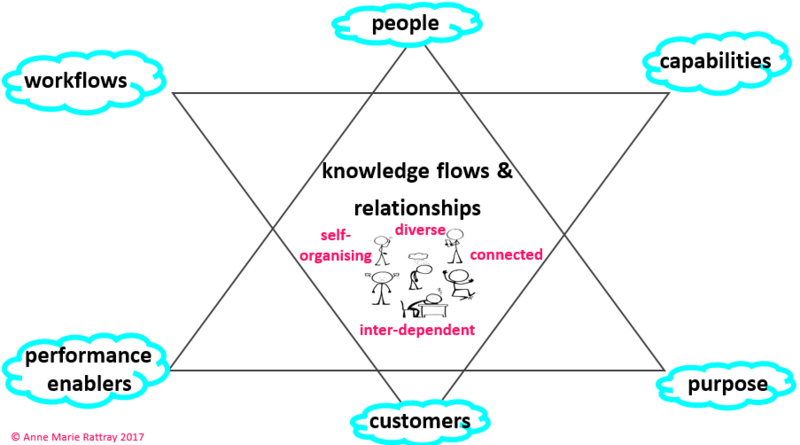 Starting with an an inverted triangle, ‘customers’ go at the bottom with ‘workflows’ and ‘capabilities’ as the top two points (that’s the equivalent of the two pillars in Shook’s house). Another triangle on top of that, with ‘workforce’ at the pinnacle (I might change it to ‘people’), and ‘performance enablers’ and ‘purpose’ on the bottom two points. Et, voila. the Smart Work Star is born! Now I can ask the sort of questions that Shook asks in his Lean Transformation Framework, and use them to explain the tools that I’ve been developing – including Tiny Triumph Learning Experiences. I’ll leave it there. The star gives me plenty of scope for other explanatory blog posts and resources (videos and voice). I once watched my friend, Eleonoor, brilliantly develop a star framework and as the last piece fell into place, she declared ‘a star is born’. The conference audience of teachers loved it. I’ve pinched her idea. She let me do it. The format of the post is also pinched from the Pixar Pitch – see point 4.